November's block is finished! This was a more difficult block to balance out with a large pale area at the bottom, but in the end, it came together! As usual, I started with the rickrack seam. After reviewing all the blocks together, I pre-located the rick-rack on this block and the last one, to help it balance with the others. I also decided what the orientation of the block would be right from the start, which is something I had not done up until these last three blocks. For the rick-rack seam, a simple straight stitch held it in place and then I added some little beads. I carried it out further by doing a zig-zag chain stitch above it. The seam element above the rick-rack seam is a feather stitch variation. I still struggle with bouillon stitches. I simply cannot get them to come out consistent, despite all my efforts and being careful to do all my wraps in the same direction, using a milliner's needle. Room for improvement! 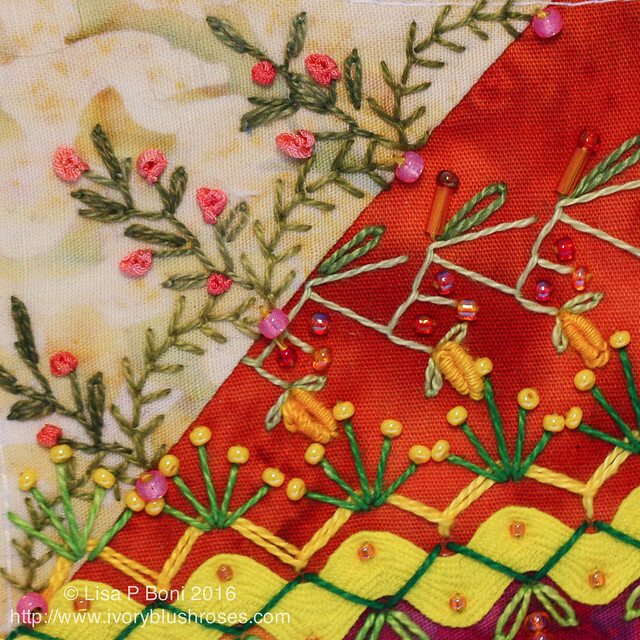 In the upper left corner, a scalloped fly stitch is embellished with feather stitch and lazy daisy plants and silk ribbon french knots. 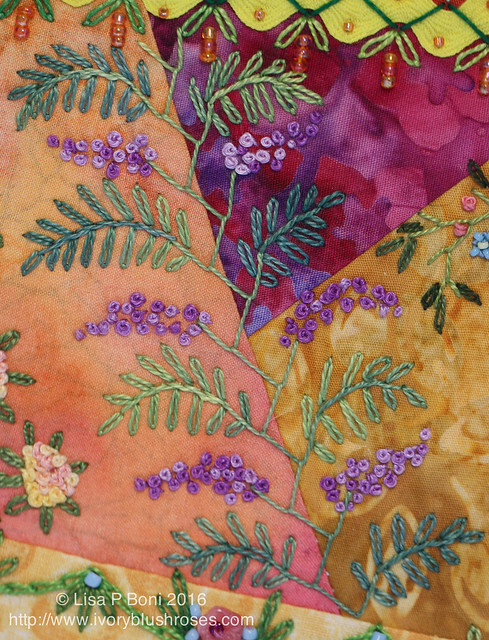 Feather stitching makes such a great foundation for leaves and flowers! I love the seemingly endless variations that one can achieve with it! I think this is my favorite seam on this block! 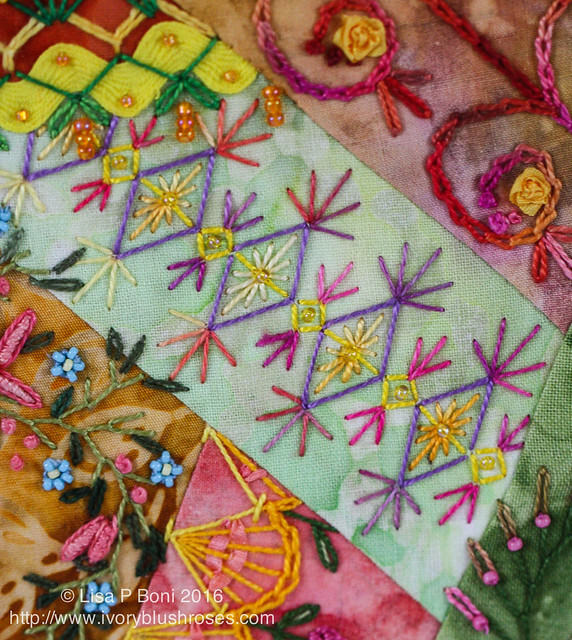 Another feather stitched seam, this time in curves, with some nice variegated lazy daisies with beads. So simple, yet so elegant! On the very first block I stitched for CQJP 2015, there was a seam of fans. I decided that the fan theme needed to be revisited one more time. This one is based on a chevron stitch, with chain stitch and then straight stitches. To give it a bit more interest, I wove silk ribbon through the spokes. 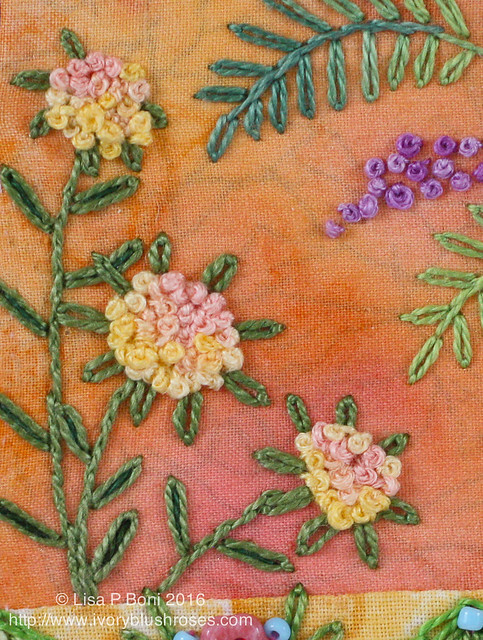 The flowers are oyster stitch done with a doubled thread. I stitched a similar motif to this on my journal cover. I liked it well enough to repeat it on this block! 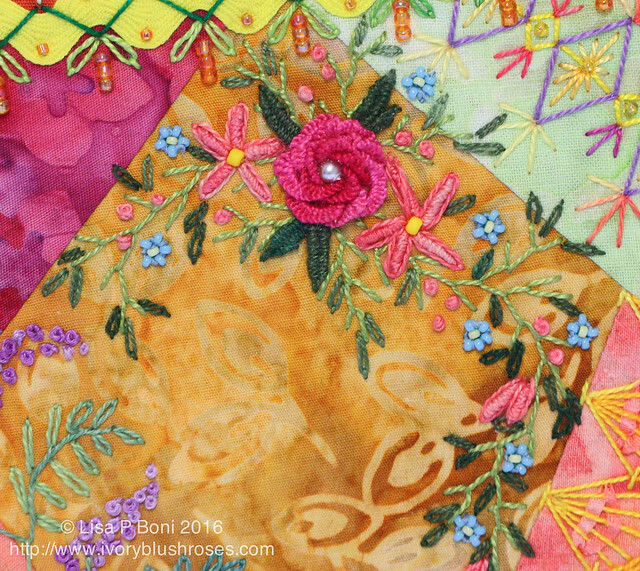 Some variegated pink/yellow thread made the blossoms much more interesting! In each block, I've tried to get at least one really geometric seam treatment. This is my variation of one that Allie Aller did and I think she got it from Pam Kellogg! She did hers over waste canvas, but I "hate" using it as I don't like how it makes the stitching loose from the fabric, so I just measured it out and marked the corners. I love how a stitch changes depending on who is stitching it! We each bring a little bit of ourselves to our stitching and it becomes our own. For the central motif, I wanted to do a cast on flower. At first I only intended to do a 6 petal flower, but it was far too small and uninteresting, so I did another round of petals, which made it large enough and gave it added interest. There is no white on these blocks except for the little pearl in the center of the flower. 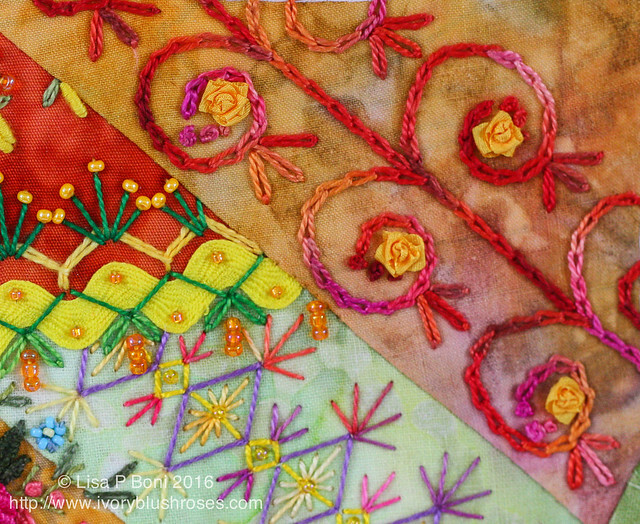 There are more wonky bouillon stitches in the 5 petal flowers. 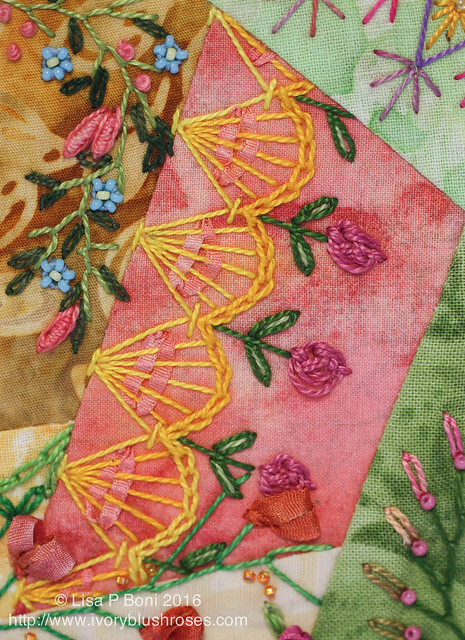 The seam on the upper right corner of the block is a variation of another stitch that I did on my journal cover. It looks completely different done in a variegated orange/pink/red thread! Little fargo roses finish out the design. For the seams on the lower two blocks, first I did a chain stitched scallop with some little flower beads. Then I did another feather stitch variation, this time a Maidenhair version with some little 3 petal silk ribbon flowers. At first I was going to fill the rest of the pale yellow patch with a much heavier treatment, but then when I looked at the block with all the others, I realized it was the perfect spot to "sign" my quilt. I finished it off with some tiny rosebuds. The signature itself was stitched by first literally signing the block with a marking pen, the stitching over it with a teeny tiny split back-stitch. 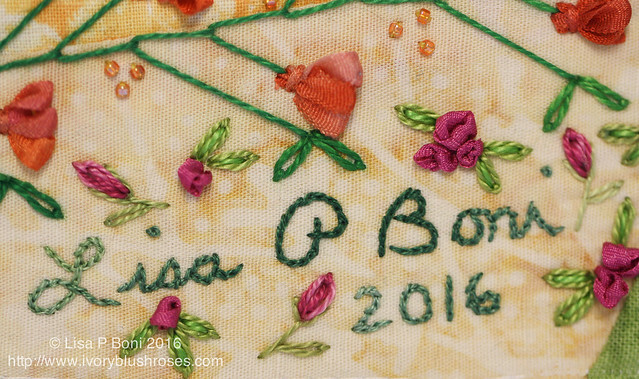 On old quilts, I always love seeing someones name and the date. Now my quilt joins the ranks! It's definitely a happy block! Now there is just one block left to go and then it's time to put it together! p.s. I had lots to post about today, so don't miss the previous post I did today! 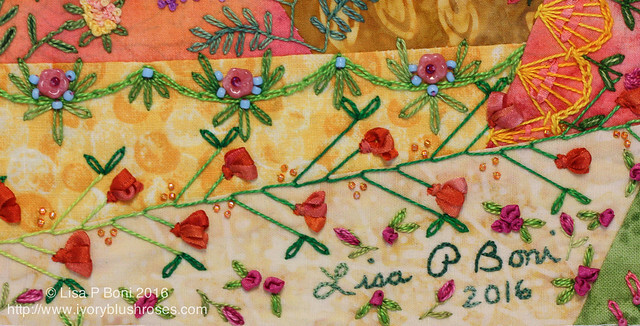 Lisa as always your stitching is breathtaking! Such a beautiful block again. Your stitching is always lovely and amazing to me. So much to see and be inspired by. You're nearing the end and I can't wait to see what you choose for the sashing! I've enjoyed this so much. 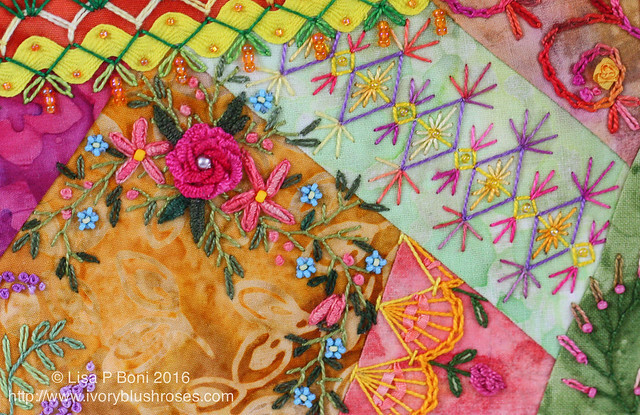 Have you chosen a project for 2016? Absolutely sensational!!! Just love your work. I have been following your blog for a while and love your work. I've never commented, but wanted to compliment you on the wonderful detail in your photography. I was going to email you and ask if you opened the seam to insert your rick rack, but your photos are so clear that I could see where you opened it and hand stitched it down. Thank you for sharing your wonderful work and yoiur exceptional photography. it has definite color change over a small area. This quilt is going to be absolutely amazing!! The colours are so incredible and make me think of sherbet every time you show a block. I love sherbet, so obviously I love your blocks! It is a great joy to see your signature on these blocks. They are all joyful and full of life through your stitches. 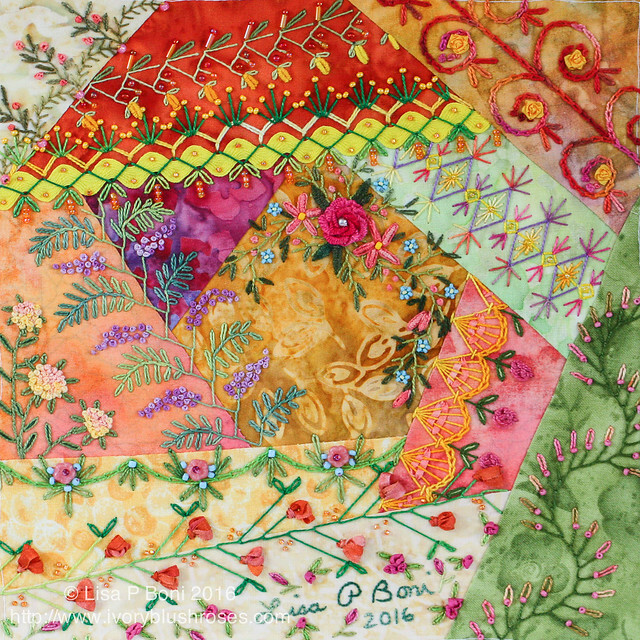 I think you could put all the pics of this quilt into a book of seam treatments and it would be enough inspiration for years (hint )!! Love to you. So glad I had a few minutes this morning before I'm off to Dad's to stop by. Will try to post tomorrow as my brother can come to stay with Dad until 3. The stitching and the glorious colors are amazing. Love it Lisa! A Blessed St Patrick's Day!